You are here: Home » Digital Asset Management Definitions » Digital Asset Management Definitions: Time For The Terminology To Be Formalised? 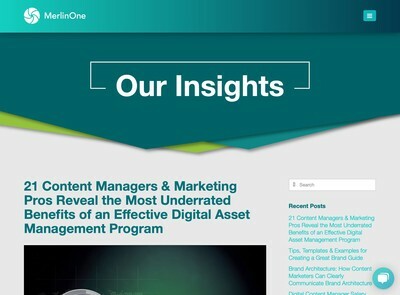 Digital Asset Management Definitions: Time For The Terminology To Be Formalised? Certainly, the consensus view among most DAM industry professionals I encounter is that DAM refers more to static media (with some basic support for time based assets) and MAM is video or audio focussed, with images and documents featuring less. For end users and prospective DAM buyers, however, the definitions are far less clear cut and you often hear the two used interchangeably as though they mean the same thing. The situation is not helped by vendors frequently moving the goalposts in order to swing a deal with a sales prospect who might be using terminology which doesn’t fit with their own product. The MAM/DAM distinction is a little easier to rationalise; a far more vexatious question is what more obscure terms like Brand Asset Management or Marketing Resource Management (MRM) mean and where one class of application ends and another starts. Brand Asset Management (never say ‘BAM’ if you really want to sound like you know what you’re talking about, I have been told) is doubly complicated because it is also a brand/marketing term which relates to the more nebulous concept of an organisation’s ‘brand’ as an asset, like stock or financial assets on their balance sheet. By contrast, DAM vendors are keen to appropriate the phrase so it refers to applications that can help streamline marketing communications production. MRM covers an ever wider scope of topics such as marketing campaign management and other more business process oriented tasks. I have found Roy Dewell’s MRM Explained site does a good job of covering the definition of MRM, but recent M&A activity in the MRM sector has further blurred the line because of the functionality that some of their parent companies offer. In the course of my journey through the Digital Asset Management world, I have found some even more obscure terms, generally fabricated by vendors keen to differentiate their offerings from competitors or dreamed up by buyers who haven’t researched the market comprehensively enough, some examples include: Broadcast Asset Management, Channel Asset Management and Sales Asset Management. I would be interested to hear any of your own examples of other corruptions of the “Digital Asset Management” term. As DAM develops as a discipline, I predict further inflation of these additional descriptions and some might even stick if those promoting them have sufficient clout and marketing budget to back them up (legitimate or otherwise). 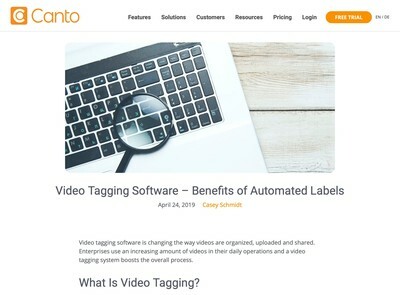 The process by which a software applications get called DAM, MAM, MRM or anything else should not be left to the marketing departments of vendors, nor how much influence individual analysts or commentators might have. 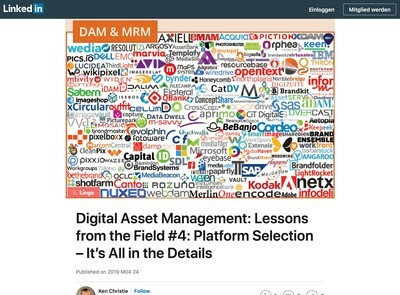 Perhaps this has been done already and I have yet to come across it, but I would contend that formalising the definitions of what Digital Asset Management means is something that academics should have responsibility for. Although not everyone will be keen on the somewhat elitist reputation higher education institutions have, I do think the process of formalising a definition of DAM is something which should be addressed by them as they are less likely to be impacted by commercial factors and have the experience to ensure the required intellectual rigour is applied to the deliberation process. There are several academic organisations in the UK who already offer post-graduate DAM courses, I am aware of King’s College in London and I know there are others in the USA also (and maybe other countries also). If any representatives of those institutions would like to comment on the work they have done (or plan to) in this complex area then I am certain there are many in the DAM sector who would be interested to hear about it. 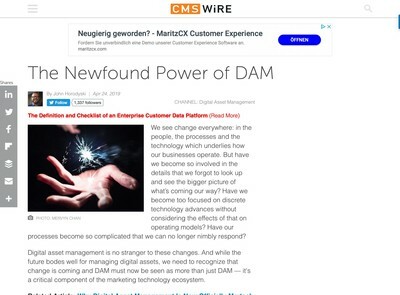 DAM vs CXM: Time For New Terminology? As far as I’ve seen there is only one graduate program for MAM and several colleges offering DAM courses. See :http://anotherdamblog.com/2010/01/20/higher-ed-courses/ for a slightly old, but more comprehensive list. I agree with the role of academics in developing formalized definitions of DAM and MAM. Allowing vendors full sway over terminology will just result in more of the made up three letter acronyms that seem to plague the market. I am going to attend my first ALA conference in a few months and am interested to see if there will be any vendors misappropriating DAM terms. I know that there is a DAM foundation and that might be the place a formalization process occurs. Next post: Big User Behaviour Data: DAM’s Only Remaining Business Model?